ARTICLE by Daisy Luther: I’m not a chemist, a physician or someone with an advanced degree in biology. I’m just a mom with an internet connection. I’m a person who has researched and compiled an assortment of worrisome facts that point in one direction: the flu shot is NOT beneficial. Some of these reasons are backed up by science, and others are an acceptance of that little voice of reason whispering “Something just isn’t right about this.” As a reader, you are welcome to take my personal instinct with a grain of salt. I strongly encourage you to do your own independent research and come to your own conclusions. Look for sources that are not linked to the dollars being earned from these flu shots – no Big Pharma funded studies, no CDC, no FDA. Check out the funding for the studies that you cite and then judge the findings accordingly. First of all, it just doesn’t work. The propaganda machine will tell you that the flu shot is “60% effective”, but this is a blatant manipulation of the statistics. This article published last year at Natural News explains how the numbers are “massaged” to present the picture that Big Pharma (who funds the research) wants presented. In actuality, the flu shot prevents the flu in only 1.5 out of 100 adults. You can wade through the abstract at The Lancet here. 1.5%. Let that sink in. That means that you have a 98.5% chance it WON’T work. Why would anyone possibly have something foreign injected into his or her body with those odds? Part of the reason it is ineffective it because it’s guesswork. Scientists must attempt to predict which 3 viruses (of the over-300 influenza viruses that have been identified) will be the most prevalent during a given year. If you get the flu shot and are then exposed to virus #4-300, you will have no additional immunity to those. Natural News just published an article that tells us many of the people being struck down in the current epidemic have received vaccinations, which clearly did not have the desired effect. Second, there are horrible things in the flu shot. The flu shot contains some incredibly nasty stuff. Obviously, it contains the virus itself, either “dead” or “attenuated” (weakened). But it also contains a host of other harmful toxins. The inclusion of these toxins is not speculation – you can read the CDC’s ingredients lists of the common vaccines in the United States HERE. Following is a little primer giving some information on the toxic ingredients that you can find in the CDC’s ingredients lists. Take the time to cross-match these toxins to the vaccine that is given in your area. You have the right to request the ingredients insert before you take the vaccine or subject your child to it. • 2-Phenoxyethanol is an anti-bacterial agent being used as a replacement for the preservative Thimerosal (mercury). It’s considered a very toxic material that could cause a boatload of side effects, including behavioral disorders … vomiting … diarrhea … visual disturbances … convulsions … rapid heart rate … central nervous system disorders … depression … kidney, liver and blood disorders … and reproductive defects. • Aluminum shows up in vaccines in many forms – like aluminum phosphate, aluminum hydroxy phosphate sulfate, and aluminum hydroxide, to name a few. It works as an “adjuvant” to stimulate your immune system’s response to the virus in the vaccine. The problem is … aluminum is a particularly dangerous neurotoxin. It has the ability to slip past your body’s natural defenses and enter your brain – potentially causing brain damage … Alzheimer’s disease … dementia … convulsions … and coma. Human and animal studies have shown that aluminum can even cause nerve death. • Ammonium Sulfate is a substance commonly added to pesticides. It’s not known at this time if it’s cancer-causing, but it has been suspected of gastrointestinal, liver, nervous system and respiratory system toxicity. • Beta-Propiolactone ranks high as a hazardous chemical on at least five federal regulatory lists. It caused lymphomas and hepatomas after being injected into lab mice, but its true effect on humans is not known. Due to animal study results, the International Agency for Research on Cancer (IARC) has classified beta-propiolactone as a possible human carcinogen. • Formaldehyde is used as a preservative to stabilize the vaccine. It’s a colorless, flammable, strong-smelling chemical that’s mostly used in industry to manufacture building materials and produce many household products. Plus, it’s also used to embalm – and preserve – dead bodies. (Remember the frog in your high school biology lab?) Formaldehyde is suspected of weakening the immune system and causing neurological system damage … genetic damage … metabolic acidosis (excessive blood acidity) … circulatory shock … respiratory insufficiency … and acute renal (kidney) failure. It’s been classified as a known human carcinogen (cancer-causing substance) by IARC and is ranked as one of the most hazardous compounds on at least eight federal regulatory lists. • Formalin helps preserve the vaccine. It’s a mixture of formaldehyde, methanol, and water. It’s mostly used to preserve tissue samples in health care laboratories and presents the same danger to your health as formaldehyde does. • Gentamicin Sulfate is an antibiotic that ‘s been known to cause deafness or loss of equilibrioception (sense of balance). It can also be highly nephrotoxic (damage your kidneys) if multiple doses accumulate over time. • Monosodium Glutamate (MSG) excites and poisons your cells and tissues. It’s used as a stabilizer in vaccines and is also found in many processed foods. MSG has been shown to cause retinal degeneration … behavior disorders … learning disabilities … reproductive disorders … obesity … and even lesions in the brains of lab animals. Allergic reactions to MSG can be severe. • MRC-5 Cellular Protein is human diploid cells taken from aborted human fetuses. They’re used as a culture to grow the virus. • Neomycin is an antibiotic that has been shown to have multiple effects on your body. It can be a neurotoxin and an ototoxin (affect hearing and balance). It also can cause respiratory paralysis, kidney damage, and kidney failure. Plus, it retards your vitamin B6 absorption, sometimes leading to mental retardation and epilepsy. Some allergic reactions to neomycin can be life-threatening. • Octoxinol-9 is a vaginal spermicide. • Phenol is included in vaccines to help stimulate immune response. Instead, it does the opposite – by inhibiting phagocytic activity. Phagocytes are your body’s first line of defense. They engulf and digest antigens and activate the other elements of your immune system. Phenol’s phagocytic-inhibiting effect actually hinders your immune system from properly dealing with the pathogens that are entering your body through the vaccine. • Phenol is used in the production of drugs, weed killers, and synthetic resins, so you can imagine the effect it has on the human body. It’s considered to be toxic to your cardiovascular, gastrointestinal, nervous, reproductive and respiratory systems … your liver … your kidneys … and your skin. Phenol is so deadly that is was used by the Nazis as a means of extermination during the World War II. Phenol injections were given to thousands of people in concentration camps – especially at Auschwitz-Birkenau – to kill those who were mentally ill, had incurable tuberculosis and were permanently incapable of work. • Polymyxin B is an antibiotic with some nasty side effects – neurotoxicity and acute renal tubular necrosis (the most common cause of kidney failure). • Polysorbate 80 (Tween-80) works as a stabilizer in the vaccine. It’s used in a wide variety of products including ice cream, milk products, vitamin tablets, lotions and creams and medical products like vaccines and anti-cancer medications. But it’s not as safe as it sounds. According to the December 2005 issue of Annals of Allergy, Asthma, and Immunology, polysorbate 80 can affect your immune system and cause severe anaphylactic shock, which can kill. It also causes cancer in animals. • Streptomycin is an antibiotic. Its main side effect is ototoxicity – the loss of hearing. • Thimerosal is used as a preservative in the vaccine. It contains 49.6% mercury by weight and has been implicated in many health conditions, such as cardiovascular disease … autism … seizures … mental retardation … hyperactivity … dyslexia … and many more nervous system conditions. Even “mercury free” flu shots may have an asterisk after the “Mercury Free” claim and if you look closely it says “trace”. That means there is mercury in it! The mercury used in vaccines is second in toxicity only to the radioactive substance, Uranium. It’s a powerful neurotoxin that can damage the entire nervous system of an infant in no time. • Plus, the inclusion of aluminum and even formaldehyde with the mercury in the vaccine magnifies the problem. Aluminum can make the mercury 100 times more toxic. Toss in formaldehyde as well, and one independent study found that mercury toxicity was increased by 1,000 times. There is a risk of terrible side effects. I’d honestly rather take my chances with the flu than to have myself injected with something that carries the risk of such side effects on the off-chance (the 1.5% off-chance) that I might avoid catching the 1% of viruses that the shot “protects” me from. If these problems occur, they usually begin soon after the shot and last 1-2 days. Young children who get inactivated flu vaccine and pneumococcal vaccine (PCV13) at the same time appear to be at increased risk for seizures caused by fever. Ask your doctor for more information. Tell your doctor if a child who is getting flu vaccine has ever had a seizure. • Life-threatening allergic reactions from vaccines are very rare. If they do occur, it is usually within a few minutes to a few hours after the shot. • In 1976, a type of inactivated influenza (swine flu) vaccine was associated with Guillain-Barré Syndrome (GBS). Since then, flu vaccines have not been clearly linked to GBS. However, if there is a risk of GBS from current flu vaccines, it would be no more than 1 or 2 cases per million people vaccinated. This is much lower than the risk of severe influenza, which can be prevented by vaccination. But what they don’t tell you is that not all adverse reactions are reported and that when they are, the statistics are doctored to keep the do-good reputation of the shot untarnished. Also, consider cases like that of Desiree Jennings, the Washington Redskins cheerleader who suffered a paralyzing nerve disorder after receiving her seasonal flu shot. Not only did the industry refuse to compensate her for her trauma and enormous medical bills, vicious attempts were made to publically discredit her. Jennings was a fit and healthy cheerleader up until August when she got a seasonal flu shot. Ten days after the shot she began experiencing flu-like symptoms, followed by severe convulsions and blackouts. After seeing around 60 doctors, Jennings was eventually diagnosed with dystonia, a paralyzing neurological disorder that causes the muscles to relentlessly contract and spasm, causing extreme difficulties with walking, talking and general body movements. Despite the fact that doctors who vigorously examined her condition at both Fairfax Inova and Johns Hopkins confirmed that she was suffering from dystonia, and that the cause of the illness was her reaction to the flu shot, numerous apologists for big pharma have ludicrously claimed that her story is a hoax and that her disease is imaginary, citing no evidence whatsoever and having had no contact with Jennings at all. • The FDA wants to be in control of ALL things ingested by the American people. The FDA is simply an enforcing tentacle of the big business organized crime syndicate that actually runs the United States, and is thus complicit in the plans of the New World Order. • The FDA can overlook the horrible side effects and suicides caused by anti-depressant pharmaceuticals while attempting to ban the sale of St. John’s Wort, a remedy that has been used successfully for hundreds of years. • The FDA can bypass the deadly e-coli outbreaks occurring in massive factory farms where the animals are squeezed in so compactly that they can’t turn around, but they want to prosecute an organic farmer for using manure as compost. • The FDA can cheerfully tell the American people, “Don’t worry, there’s nothing to see here” with regard to the ever-rising radiation levels in milk but they want to raid the dairies of an Amish man who sells milk right from the cow, as it has been consumed for centuries. • The FDA wholeheartedly supports genetic modification of our crops and livestock. The FDA endorses additives and preservatives. The FDA promotes chemical pharmaceuticals over gentle natural remedies. And finally, when the media pushes it, I automatically decline. Seriously – anytime there is a big hype or something is made to be mandatory, my gut tells me “This isn’t good.” Look at all of the commercials for anti-depressants. Look at all the soothing newscasters telling us how “we don’t have to suffer.” Look at how GMOs are being promoted as the answer to world hunger. Real journalism is all but dead and can only be found in alternative media sources. The mainstream media is Public Enemy #1, a group of corporate whores who put on make-up and a pretty outfit in order to seduce the public into believing what the puppet masters want them to believe. The media is owned by the same tie-wearing serial killers who own Big Pharma, government agencies, and the financial industry. It may sound illogical but I firmly believe the MSM is complicit in the overthrow of personal sovereignty. Therefore, if something is heartily endorsed by them I am immediately suspicious. I refuse to be submissively led along by the folks on the tube. When they repeat something over and over, at the very least it requires close and careful investigation, if not an all-out rejection of what they are saying. There is nearly ALWAYS an agenda and that agenda is nearly always one that crushes liberty or health in the name of power or money. Any mainstream article on the flu that you read states some form of the following: ”The best way to prevent the flu is to get a flu shot.” It is a not-so-subtle brainwashing. It hearkens back to the theories of Nazi Minister of Propaganda, Joseph Goebbels. This programming has allowed many organizations to make the flu shot a term of participation, with little outcry from the public. 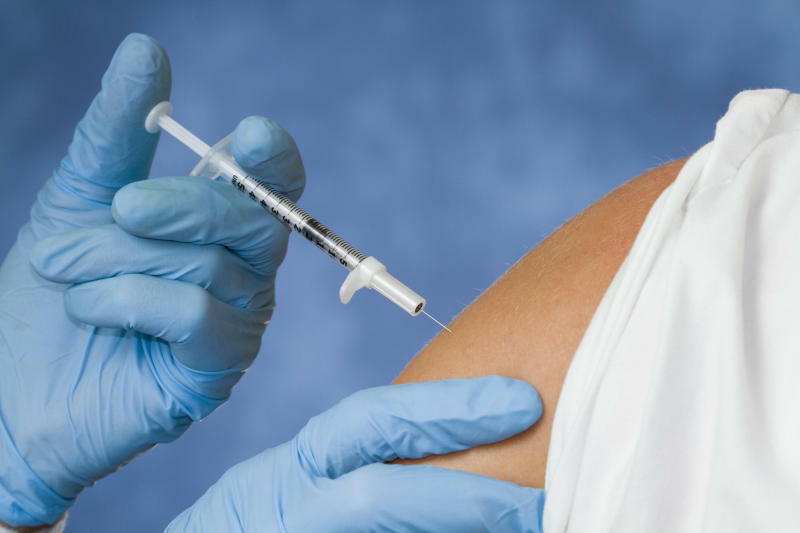 Workplaces, schools and other activities across the US and Canada have instituted policies that force all participants to receive a flu shot. Longterm hospital employees have been fired for refusing to have the toxin injected into themselves. Children have been banned from pre-schools and daycares in 6 states. In brighter news, widespread refusal of healthcare workers in British Columbia has resulted in the province dropping the policy for the remainder of the year. I don’t believe that all healthcare professionals and flu-shot advocates have ill-intent. I think that many of them have just sipped the mainstream media Kool-aid – the tale-spinners of Big Pharma have slipped in just enough truth to make their theories believable. Many people are deep-down decent and have difficulty believing that such a perverse money/power agenda could exist. Mandatory policies of this nature always trigger a suspicious response from me. They whisper the ominous words “soft-kill eugenics” to me. No, I don’t have proof of this, but I’d rather err on the side of longevity. I’ll take the risk of illness that my healthy immune system can fight off over the risk of being forcibly inoculated with whatever toxins the creators of these vaccines choose to include. I’ll use my little arsenal of home remedies and come through it without the risk of long-term side effects that have yet to be discovered (or at least, have yet to be made public). What do you think about the flu shot? Did you take the vaccine? Why or why not? Please feel free to share links to any interesting sources or studies on this topic.